Large Chandelier from the Cercle Wagram Casino, Paris, France. One-of-a-kind, spectacular wrought iron chandelier and glass from the Casino Cercle Wagram in Paris. All faces of the chandelier are in carved frosted glass depicting a geometric Art Deco motif. The lighting is diffused through the bottom of the chandelier, eight faces diamond shape containing eight high wattage light bulbs and through 20 four faces boxes located all around the chandelier. 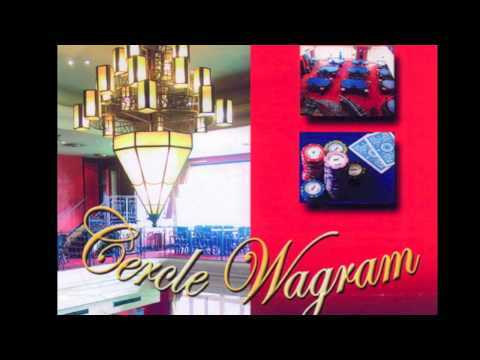 The casino was located 47 Avenue de Wagram in Paris 75017 and has been closed in 2011. The last picture is showing the chandelier in the movie " Comme les 5 doigts de la main " by Alexandre Arcady with the two actors, Vincent Elbaz and Patrick Bruel in the Casino. Measurements: 11 FT High. x 6 FT 10 Diameter.